My dear friend Nicki Peasley guest posts for me today…I often lean forward when she speaks, just waiting for her wisdom and goodness. She holds space in a really tender way, you can read more of her soul magic here and here. I have been hugging lots of trees lately. In gratitude for their unconditional love for us crazy humans. No matter how careless we are, the trees continue to offer us their beauty, inspiration (literally), solace from the rest of the world… their lives. Trees have no ego. While I sense their acceptance of human appreciation, they don’t expect it. They don’t need it. They are here to watch over us. Still and all powerful. Yet so very vulnerable. 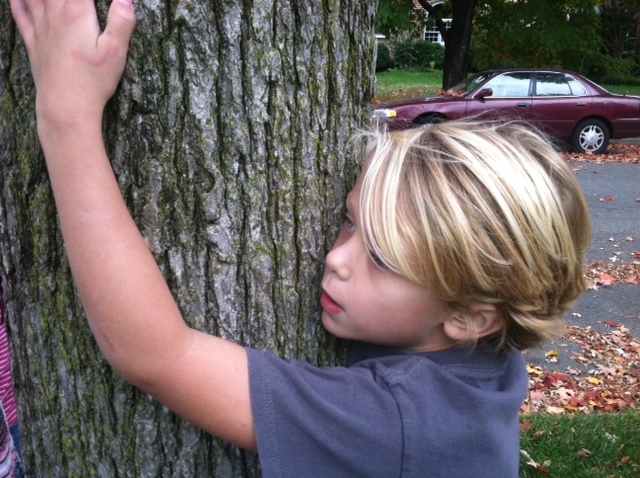 Before Hurricane Sandy came through, my kids and I went around our neighborhood hugging the trees, infusing them with our compassion and wishing them strength through the storm. And once again, even on the brink of what could have been their destruction, they offered us their compassion, their strength. No fear, only this amazing sense of calm and acceptance for what is, what will be. There are conversations among the trees. And if we listen with open hearts, we can even hear them speaking softly to us. This is what they tell me. I carry the tree’s wisdom with me throughout my days. I watch the world through the eyes of our wooded friends to see the endless human race and all of its dynamics. The champion, leading the pack with easeful and brilliant stride; those determined to be the champion, passion in their eyes; the walkers, who just keep moving, unattached to any outcome; the cheering crowd, dancing and merrymaking on the sidewalks; the injured, defeated and hopeless… and those tender souls who care for them. We have all played each of these roles at some time in our lives, perhaps even several at a time. But unless we take time to stop (even the champion can stop for a moment) to honor the raw vulnerability of every human experience, we are missing out on the message of the trees. I’ve had a cramp (to extend the metaphor) the last few months. And while it has loosened its grip on me, I am still not quite ready to start running again. Often, I veer off the course entirely, finding myself in the woods… with the trees. But I am quick to catch myself in this destructive pattern. And I am learning to find great contentment in being the tree. Appreciating each season of release, stillness, rebirth, and awakening. Watching and acting with intention, without attachment to ego, and manifesting simple gestures born of Spirit. 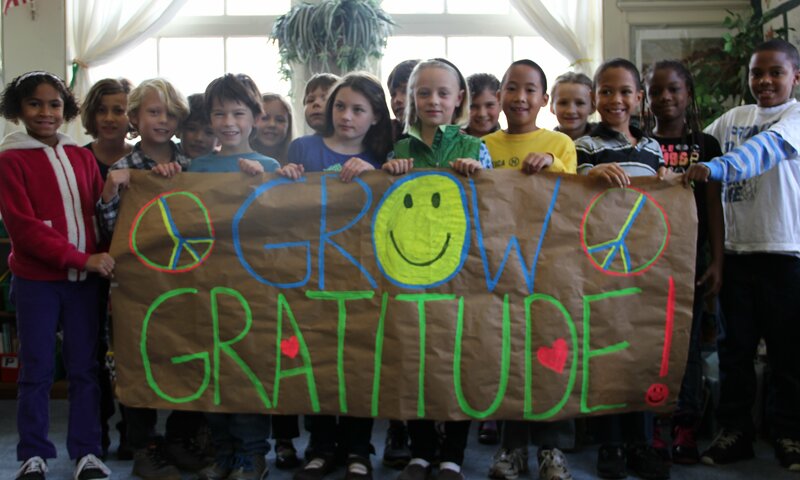 At the beginning of the month, I started a Grow Gratitude movement at my youngest child’s school. 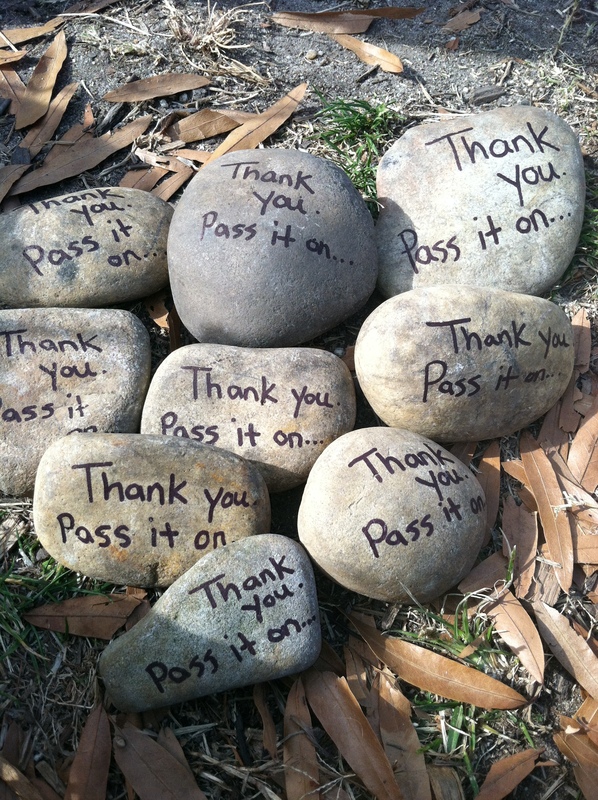 I experience gratitude as the purest and most profound way to connect to self and other. To focus on what’s right in our lives and in our world, instead of what’s wrong. To appreciate others not for a gift but for being the gift. To open ourselves up to all the little miracles of every moment. And to see this understanding unfold at an elementary school is nothing short of magic. Ms. Campbell’s Class, getting primed for a whole school Gratitude Gathering in which they use their voices and sign language to express the community’s collective appreciation. 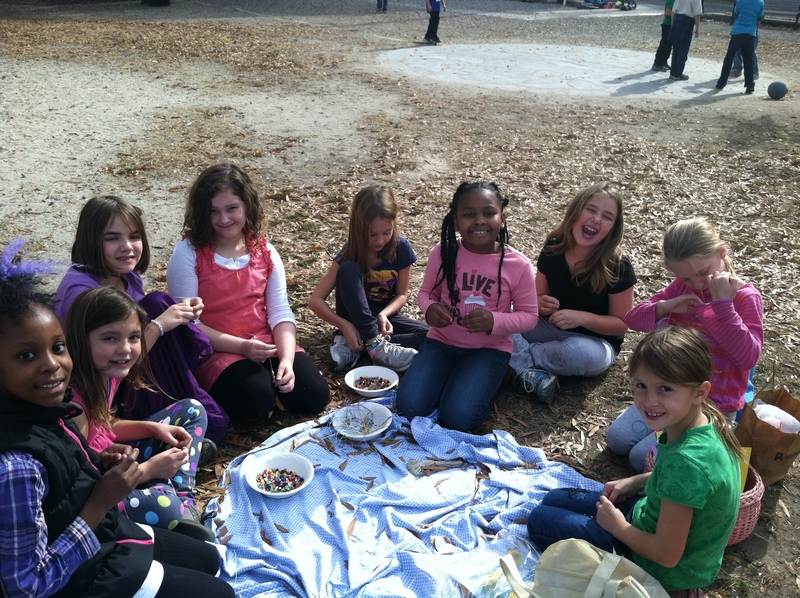 On the playground making gratitude chains (to wrap around the cafeteria) and gratitude bracelets. What is making your heart sing in this moment? 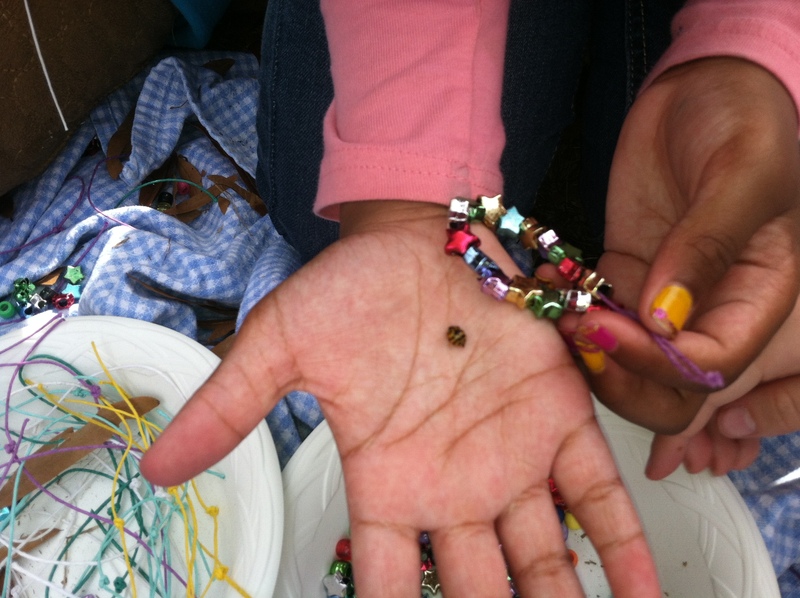 A lucky ladybug joining the Lovefest. Love leads us to beautiful places when we allow it to. And on that journey, we are wise to stop every now and then to hug a tree and listen to the message it has for us. Then, when we are ready to start running again in that crazy human race, it will be with joy and ease and Heaven in our feet. 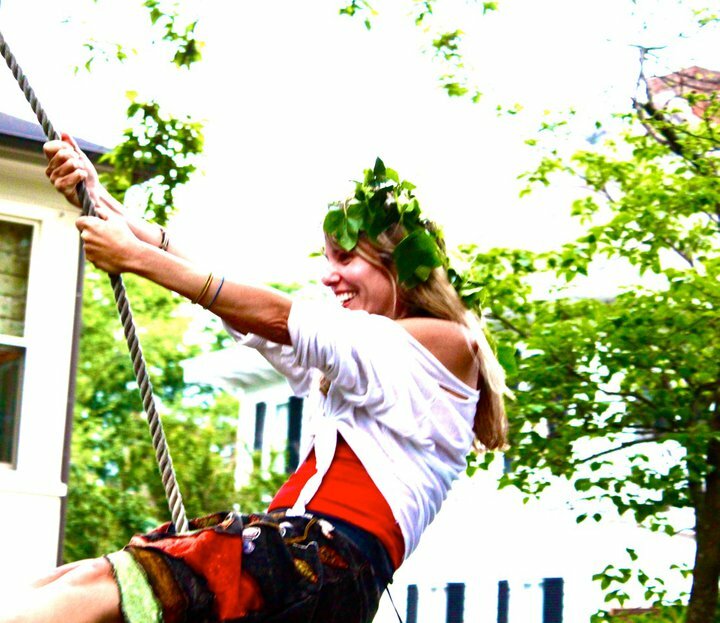 A meditation to do with your children on Thanksgiving Day…which is really any and every day. Close your eyes or look down. You may place your hands on your heart or rest them on your legs. Take a slow deep breath, in through your nose and out through your mouth so that a very soft sound is made. Picture yourself surrounded by beautiful light. As you breathe in, inhale the light and feel your body filling with it. And as you breathe out, exhale all the yucky stuff that has taken up space in you—any pain, any anger, any worries.. let them all go in your breath. So that you feel completely at peace in your body, in your mind, in your heart, and in your spirit. See all the places that bring you joy (your home, your school, the swimming pool, the beach…) What places make you smile? Now see the things that bring you joy (pizza, your bike, your computer, your favorite stuffed animal…) What things make you smile? Now see all the experiences that you have enjoyed in your life (vacations, soccer games, birthday parties, holidays…) What experiences make you smile? Now, most importantly see all the people you are grateful for (your parents, your brothers and sisters, your friends, your teacher, your coach…) Who makes you smile? Allow that smile to show on your face and feel the gratitude that is bursting out of your heart. 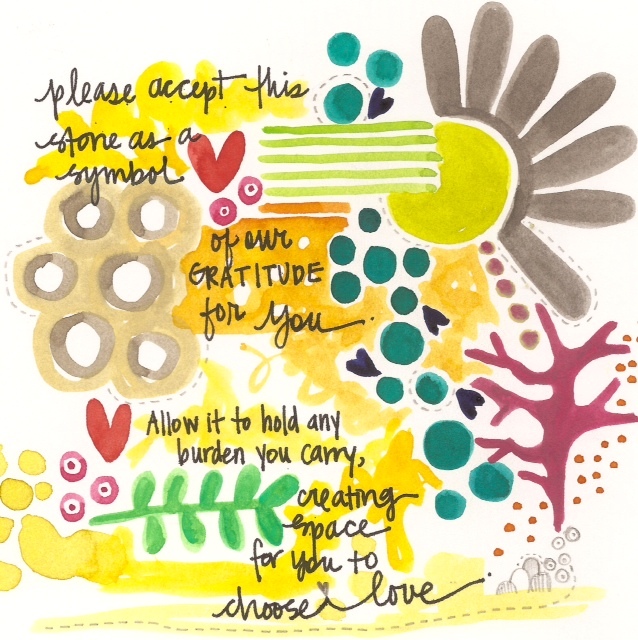 Offer the sign for thank you. Give yourself a hug. And slowly, open your eyes. May you hold this feeling of peace and gratitude in your hearts always. This story about the trees is beautiful. When I was a child my mother gave me the book The giving tree it is my favorite story and has life lessions in it. Oh wise wise women! Feeling so grateful that you share your wisdom, and that I am lucky enough to receive it! Timely and beautiful.